Lofa Tatupu is a stud, folks. Right now, you can make a great case for Tatupu as the NFL's Defensive Rookie Of The Year. He has 62 tackles, 3 sacks, and an interception in 9 games this season. 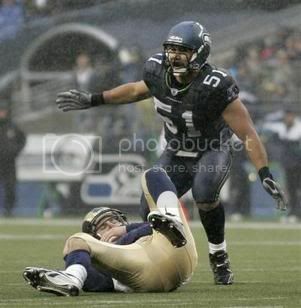 The Seahawks defense is vastly improved because of Tatupu's presence. There's a reason why we trusted Seahawks president Tim Ruskell during the offseason.